And now there is a FOURTH company. I walk around downtown all the time, pretty much every day, and I can tell you that Dallas cannot handle bike share. 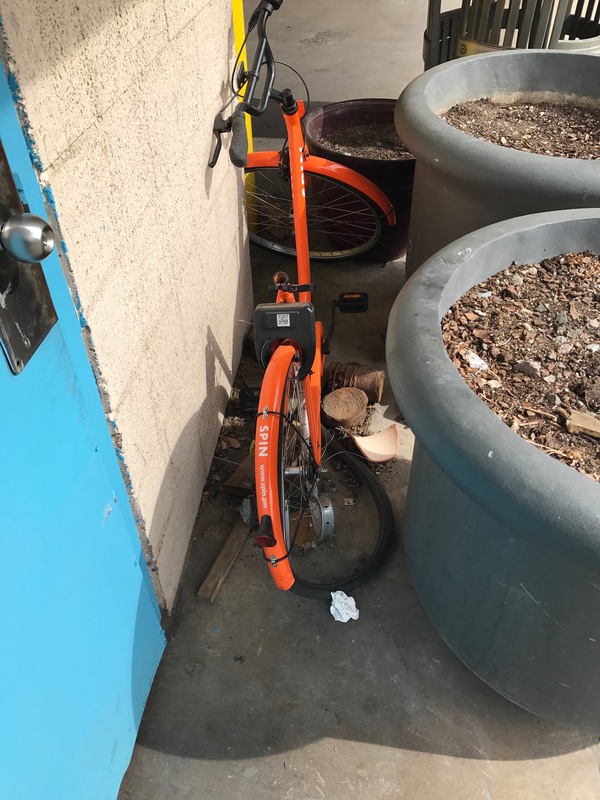 The streets are littered with bikes from VBike and Spin and LimeBike, not parked so much as abandoned in the middle of a sidewalk, at least half of the time tipped over. It’s not just in downtown. Bikes are abandoned on the Katy Trail, randomly in neighborhoods, dumped anywhere and everywhere. In the Trinity. In White Rock Lake. It’s been bugging me for a while, but today, I saw two things that made me realize we are at a crisis point. 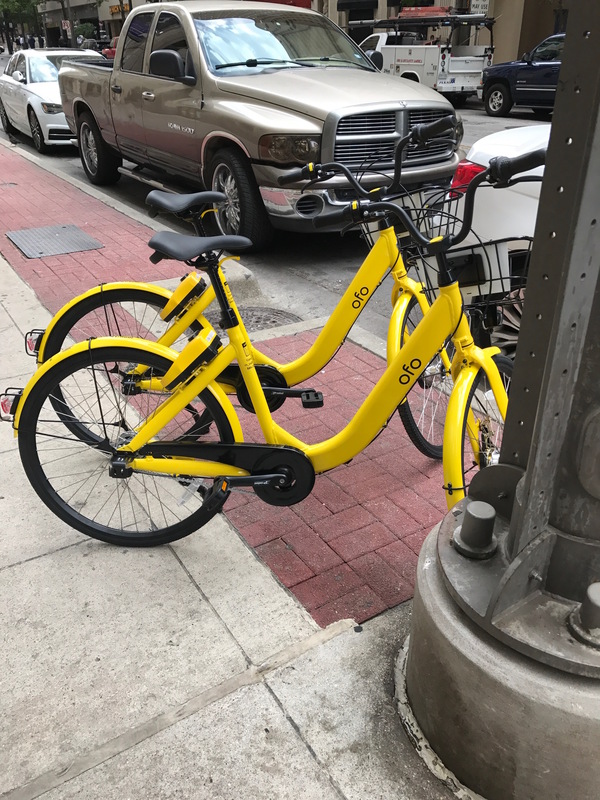 First, there is ANOTHER bike share company in town: OFO. That, if you are counting, yes, makes four. Not sure we could handle one, definitely can’t handle two, three is like, “What? !” and four is so dumb it’s almost funny. 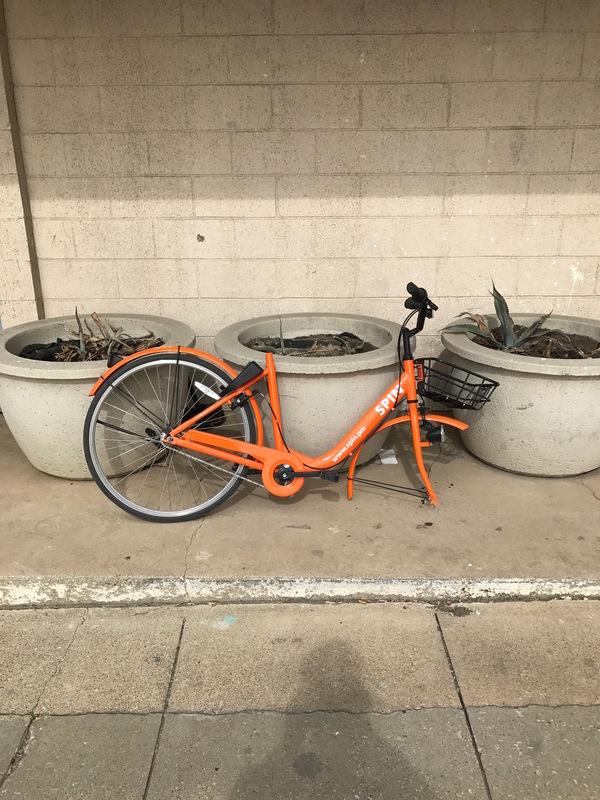 Because a couple of blocks away, after weaving through an obstacle course of other left-behind share bikes, I encountered these two dead Spin bikes, 10 feet away from each other. Again, I think it’s a good idea. But I don’t see a way forward. While walking around downtown with a friend Sunday night, she compared the share bike situation to glitter. We’ll be cleaning it up forever, and just when we think we’ve gotten all of it, a little more will pop up.